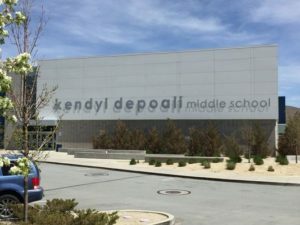 The student, who attends Depoali Middle School, is identifiied in the lawsuit only by his initials, “G.M.,” but a press release from the Firearms Policy Coalition identifies his mother as local police dispatcher Audrey Guardanapo and his father as former law enforcement officer and U.S. Marine veteran Shaun Guardanapo. Just days before filing the lawsuit, the coalition launched a website and accompanying guide aimed at helping students who identify as pro-gun use speech and their First Amendment rights to counteract this year’s nationally organized student walkouts calling for stricter gun control legislation. “At the end of the day, that’s all it takes to constitute a First Amendment violation,” Combs said. The school district said it was served the lawsuit on Tuesday morning and is “looking into the allegations at this time,” but could not comment further.